Catherine Newman is what so many Literary Mama readers aspire to be: a working mother writer. She is the etiquette columnist for Real Simple, the editor of the kids' cooking magazine ChopChop, a book reviewer for More, and a contributing editor for Family Fun. Her mother writing has appeared on The New York Times, in O, the Oprah Magazine, The Boston Globe Magazine, Scary Mommy, Self, The Huffington Post, Brain, Child, Full Grown People, and Redbook. 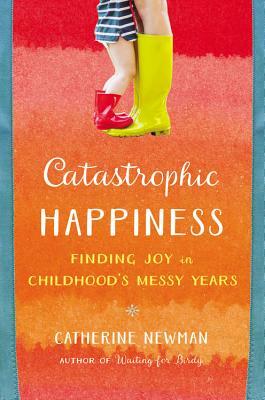 Her new book, Catastrophic Happiness, is a collection of essays that touch on everything from the mad obsessiveness of toddlerhood to the unexpected satisfactions of the teenage years. Literary Reflections Editor Libby Maxey sat down with Newman to discuss the book, but they talked about a good deal more. The following is an edited transcription of a conversation that was interrupted constantly by mutual laughter—which is exactly what you should expect from a conversation with Catherine Newman. Libby Maxey: You've been writing about your kids for a really long time, and, I wonder, do you ever get bored of being a mother writer? Catherine Newman: Is it getting boring? Is this your way of saying that it's getting boring reading about them? I totally understand. LM: Not at all! But you have all these anxieties about parenthood. Do you have writing anxieties surrounding being a mother writer? CN: No, I really don't. But I will say that I recorded the audio for the book, so I read the whole thing out loud. Oh my God, by the time I was done, I was like, this is basically an argument for anti-anxiety medication. The whole book! I'm so afraid they're gonna die, and then they don't die, and I'm swamped with gratitude. I was embarrassed at how repetitive that was. But I think that theme must speak to people because even though I feel like I keep writing a version of the same thing over and over again, I get positive feedback about it. So my hope is that it's not dull to people. I don't write about the kids that often anymore. It has to be something they vet. I think if I were writing about them week after week, I would be really over it. LM: Ben and Birdy are now 16 and 13. As your kids get older and they're less these sort of crazy, adorable Platonic forms, do you find it a different kind of challenge to write about them? CN: Sure, totally! Because they're people whose stories are their own. Their lives are their lives. Not that that wasn't true when they were little, but I seemed to be blissfully unaware of it then. I have always written more about myself, actually, than about the content of their actual being. I mean that I've always used mothering as a way to explore my psyche more than theirs, if that makes sense. But as they are now teenagers, there's very little I can write about them that doesn't kind of break that contractual obligation I have to maintain their privacy. So the things I write about are ways of questioning my own parenting, or the way I feel about the kids, without really betraying anything that matters to them. I just wrote something for The Washington Post about Ben and what we call "The Catalogue of Grievances." He's the sunniest person, but he loves to be provoked into rehearsing all the times we annoyed him or upset him. Mostly they have to do with where he slept on vacation—for example, we were in a king-sized bed, and he was on a mat on the floor, and he's so angry and offended still, even though it was 15 years ago. He loved me writing about "The Catalogue" because he had a bigger audience for his grievances. So even though it wasn't a thing that mattered a lot to him, it allowed me to say important things I wanted to say about parenting. But it gets trickier. You know—you can't go for the obvious stories because you can't write about the teenager things. Maybe people are doing it well, but I don't feel like I could do it without betraying the kids. So you have to write about these weird, off-to-the-side things. LM: When did you start having your children vet what you wrote about them? CN: I wrote something for The New York Times about Ben having long hair. And I wrote it in a political moment: Mitt Romney had said something about whether he had or hadn't participated in the cutting off of a kid's hair when he was a teenager, and I had this really strong response to that statement because Ben got so much crap for having long hair. Because I knew it was going to be in The Times, I knew it would have a big audience, and I showed it to him because I wanted to be sure before it was out in the world that he felt okay about it. And he did—in a not-very-satisfying way. He wasn't like, "No you can't!" nor was he like, "Wow, Mom, that's so brilliant." He was just like, "Oh yeah, that's fine." LM: Is his response pretty representative of the kind you get from your children? CN: No, Birdy loves to read stuff about herself. Ben's just not a big reader, for one. He likes to say that the world of feelings isn't his big area of interest. But Birdy loves to read stuff about herself. She knows all the stories from her own babyhood. LM: I love the passage in the book where you talk about the moral importance of learning to manage boredom. It made me think about how, for the Literary Mama audience, a large part of managing boredom is about reading and writing. I see many essays from mothers who are very anxious about their kids and reading. These children who were really into books when they were five years old are now ten years old and are pushing away, which feels like a catastrophic thing. You say Ben isn't really a reader, and, I wonder, have you ever thought, "This is so wrong, this is terrible"? CN: Oh my God, sure! I totally have. The really funny thing is, you're getting me at this moment where I've made my peace with it, weirdly. Reading is my favorite thing. My best day is a day where I'm just sick enough to stay in bed all day with a book. And Birdy's a reader. But the thing is, my husband Michael's not much of a reader, and as appalled as I am by that, he's an intelligent person who has a lot of great interests: he plays the banjo, he plays the guitar, he's a marathon runner, he's a philosopher. And Ben is not a reader, really; it's not what he does for pleasure. He once said that it makes him so irritated when people say, "Hey, what are you reading right now?" as if everybody should have the same hobby. He said it always makes him want to say, "Hey, what are you playing on the piano right now?" And I feel like, fair enough. I've always said, "Oh, it's so important to love your kids for who they are," until it's something that matters to me. You know? Which is so funny. It's like, "Oh, if the kids are gay, I'd be thrilled!" Well, of course I would. I love gay people. That's a fake test of my openness. A real test of whether I put my money where my mouth is: Can I love and appreciate this kid who doesn't read? And, in fact, I can. LM: One of the things I identify with most in Catastrophic Happiness is the way you're self-conscious about how distracted you are, particularly in the early years, and how often you don't really listen to the kids. Yet the book is made up of observed details and conversations that feel accurate and very believably recorded. Talk about that paradox a little—about not entirely paying attention to them and yet also paying intense attention. CN: I think that my attention wavered. Sometimes I paid incredible attention to the kids, and sometimes I paid no attention to them. What I think is right, although it's not what I always did, is to either pay attention to them completely or basically not at all. I think the worst and most confusing thing is to have my laptop open, someone's telling me something, I look up every now and then, but I'm not with them. That half-attention is the thing I talk about in the book as devastating. I am happy to ignore them completely, truly, which I did a ton of when they were little. I would be working in the next room and they would be entertaining themselves; I'm a huge believer in that. But the parts where I'm really recording stuff, that's the paying attention, which often happens at night. That's when I've had a glass of beer, I'm lying in someone's little bed with them, the laptop's downstairs, it's dark, they're going to sleep, and, suddenly, I'm filled with attention and tenderness—you know, in the one minute before they nod off. Somebody made fun of me for always talking about crescents of eyelashes, but I spent a lot of time looking at their falling-asleep faces, because I was really paying attention—while they were falling asleep. LM: I'm not mentioning any New York Times reviews here (neither this one nor this one), but you go out on a limb to write about such personal material, knowing that somebody's going to criticize it. Does criticism feel any different than it used to now that the kids are older, or does it feel like it's still the same outsider criticism of something very personal? CN: I think I'm getting thicker-skinned, for one. I'm getting older and more confident—not that the way I am is right but that the way I am is the way I am. The Times criticism is complicated because I grew up in New York City, and my life-long ambition has been to be reviewed by them. So, my horror at being criticized was twinned with the absolute thrill of being reviewed in The Times in the first place. My parents wrote and called, and their friends called. My parents' whole 80-year-old posse got in touch, so that was exciting to me, even though the critiques were painful—and stuck in my craw. I turned the criticism over a little bit and then was like, STOP. That's enough. It's narcissistic, and it's a waste of time, and it doesn't really matter. And a lot of people wrote to say, "Oh, they don't know you. If they knew you, they wouldn't have written like that about the way you are." Which I thought was really sweet. Publishers Weekly wrote a very positive review of the book, but its criticism was that the book was not very useful. LM: Because the book has that "quasi-how-to" structural conceit? CN: But it doesn't tell you anything! By the time you're done with it, you've learned nothing about how to do anything. All you learned was how to be a neurotic Jew. It's not a "how-to" at all, and it doesn't claim to be, but I think it's interesting that as soon as a woman is writing about something, it is not enough that she tell her story. I should also be offering laundry and diapering tips. There's something about that view that's unsavory to me, that's anti-feminist—to presume that this would be a book that's service-oriented. But the review made me laugh. LM: You have a middle-grade novel coming out soon. Do you see yourself putting away mother writing to focus more on fiction? CN: I don't know. I have been writing about the kids a little bit more in the last couple of months. I think it's maybe because they pressure you to write a lot when your book comes out, to get a lot out there. I would love to write more middle-grade literature. I love that age. That was my golden era of reading; the books I read as a middle-grade reader were all the best stories I ever read. LM: What were your favorites? CN: Oh, like Joan Aiken and Madeleine L'Engle—novels I still think about and loved so much. And Birdy, at the same age, has read these incredible books like Wonder and Counting by 7s. So I would love to write something like those, but I think I need to wait and see. My writing is the main way we pay bills, and so I really have to write a lot for money. That means writing whatever somebody wants to pay me to write. Sometimes it's so disgusting what I'll write for money. It's unbelievable to me—like, sweepstakes copy and, you know, just terrible, terrible things. If I can make a quick $200 in 45 minutes, I'm there. I will write almost anything, as long as it's not directly in conflict with my politics. I would not write, for example, a cigarette ad, but I would write a tampon ad, you know? That kind of thing. LM: So, do you have any writing advice, especially for other mother writers? CN: I do! I have this really weird piece of advice that I dispense freely since I think it's such good advice. I will grant that a middle-grade novel is not a super long thing to write—around 30,000 to 50,000 words. But it's a lot of writing nonetheless. I wrote mine by being in a writing group that never met. The group was just me and one other person that I barely know, and we did not even read each other's work. The group was all about accountability. Every Friday, at the end of the day, we said, "Did you do your writing for the week?" That writing was 500 words of a project that was not explicitly deadline driven (so, not just your regular work). You had to write 500 words of a long-term dream project, and you had to do it every week. Five hundred words. That's about an hour, two hours. I wrote the book in a year—a year of 500-word-a-week assignments that I was held accountable for, although nobody was reading my stuff. Don't you think that's good advice? LM: I do! I think that's great advice. CN: Because people say, like, "Write 1,000 words every day." Who—who is doing that? LM: People who aren't paying the bills? CN: People who aren't paying bills. If I were, like, a kept woman . . . although then I would just be lying on the couch with a magazine, like a normal kept woman. But I feel like that 500 words a week, you can actually do that. You really can. That's my advice. LM: Alright then, I'm so glad I asked. Libby Maxey lives in rural Massachussetts with her husband and two young sons. With her academic career as a medievalist having died a stunningly swift death by childbirth, she now works as an editor, writes poetry, reads when able, and sings with her local light opera company. Her work has appeared in The Mom Egg Review, Tule Review, Crannóg Magazine, Pirene’s Fountain, Mezzo Cammin and elsewhere. Her first poetry chapbook, Kairos, won the Finishing Line Press New Women’s Voices contest, and will be published in June.